It is an “Euroclass A” product regarding its fire reaction. This characteristic is especially relevant when a fire occurs, since it blocks the fire propagation, smoke emissions or flaming droplets of polyurethane or polyethylene, as it sadly happened in June, 2017 at Grenfell Tower (London). 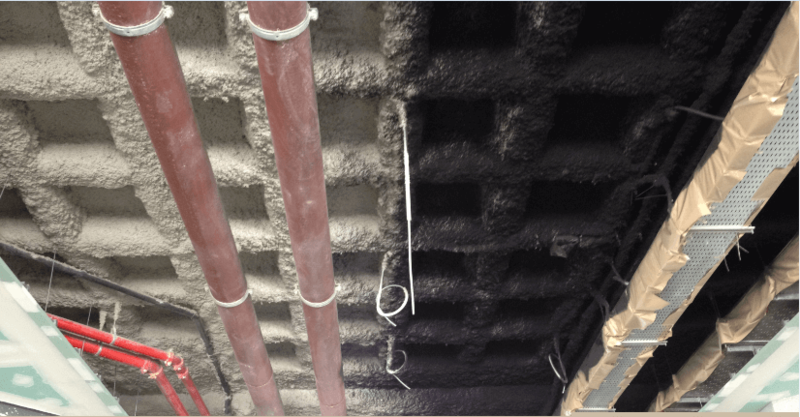 This mortar is specifically recommended for places that require an incombustible thermic insulation, as ventilated façades, ground floor slab structures mainly used as commercial premises. It is also recommended on car parks slabs. 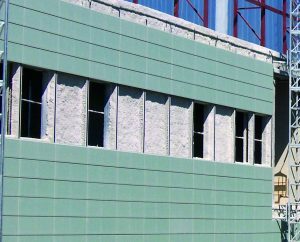 Besides its excellent thermic isolation characteristics, Tecwool® T mortar provides a great sound absorption due to its application method. It is tested as a Class B in Acoustic Absorption. 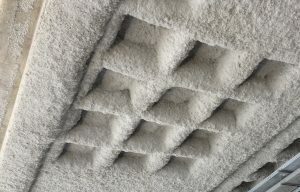 Along with the thermic insulation, it provides an extraordinary comfort when absorbing noises or conversations from the premises or garages under the dwells. The pneumatic projection application provides a continuous insulation on every surface. It also has a perfect adherence to almost every surface used in a work: concrete, bricks, ceramic blocks, etc. This lack of joints means an advantage compared to rigid rockwool blanket or fiberglass, which are set over the facing wall with fixing elements. Pretty soon, due to the gravity, the union joints of these sheets open and create thermal breaks into the buildings. This circumstance is especially severe when the sheets are installed on slabs, since they are elastic materials and time leads to stretching and bending that ends in thermal breaks. Tecwool® T mortar has neither glues nor resins to agglutinate the fibre. It only includes white concrete as bonding element, that hardens once it is forged and gives an excellent coherence to the product. Besides that, this product can be painted for a better finished if required. 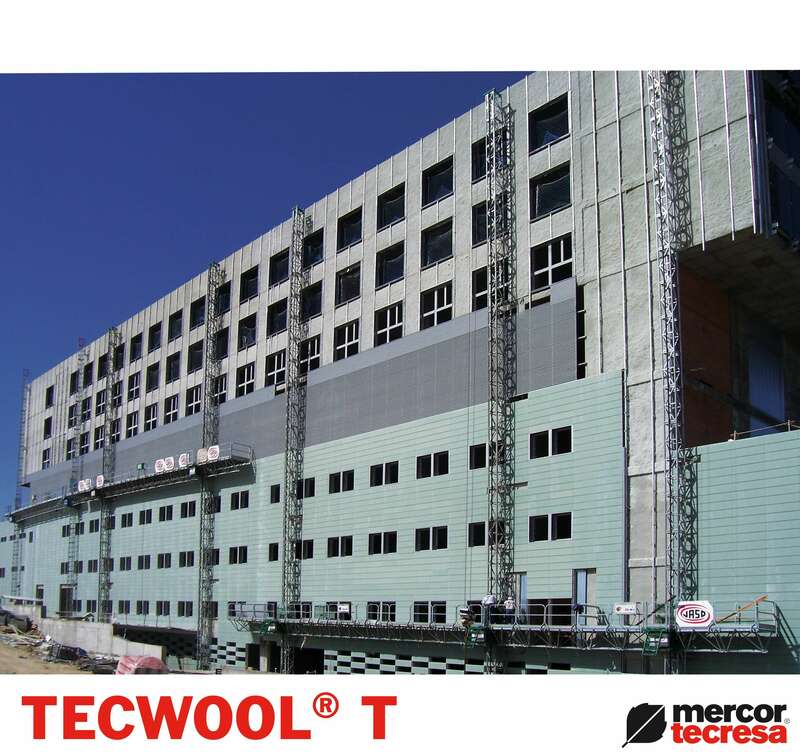 Tecwool® T under slab with natural finish and painted in black. .
Tecwool® T on ventilated façade. 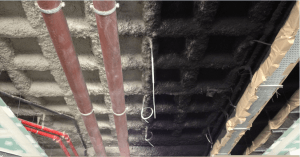 How are Tecwool® mortars applied? mercor tecresa® provides a special spraying machine for its application.